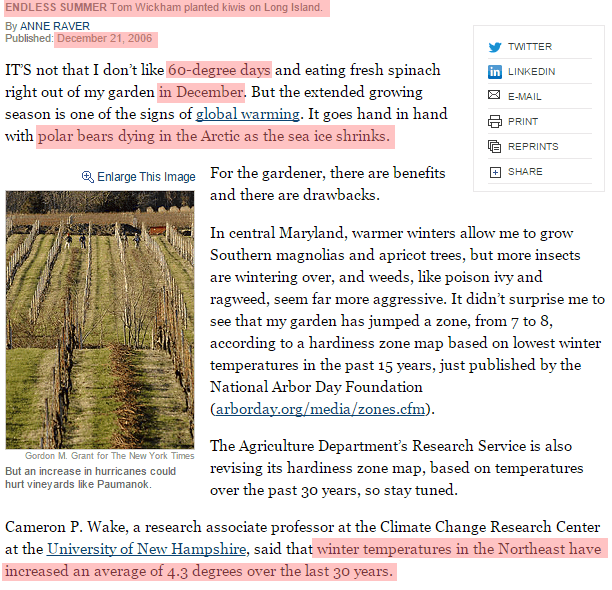 In 2006, the New York times announced the end of winter and said that winter temperatures in the Northeast had increased 4.3 degrees. 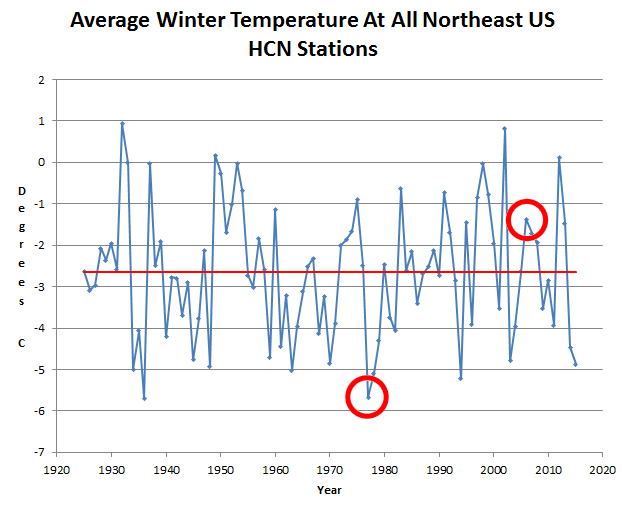 There has been no change in Northeast winter temperature over the past 90 years. 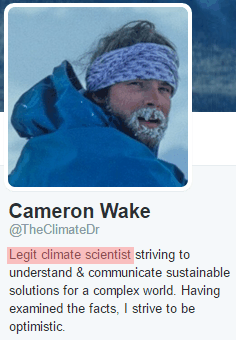 Climate fraudster Cameron P. Wake simply cherry picked a cold year to start his trend. the last two winters have been among the coldest on record in the Northeast, and five out of the last seven winters have been colder than normal. I wish all Predictions were backed by a financial endowment (to a Charity) if they get it wrong. Misleading the public on such a scale, is more than irresponsible; it’s negligent & fraudulent. It also leads to deaths. Since these ‘scientists’ KNOW they are producing propaganda to support the ‘CAUSE’ and they also know their fraudulent information leads to fuel poverty and increased winter deaths in the UK that is PREMEDITATED MANSLAUGHTER! And that is not even getting into the deaths and unrest in Africa, Latin America and Mexico as farmers are driven off their land. This is the result of NAFTA but the names behind it are the same. Bill Clinton and Al Gore among others. Dr Wake is a deceitful rat Gail, just like Bubba Bill and that fink Gore. They do not have our best interests at heart as you so rightly point out. They really do think we are as dumb as toast. By Anne Raver needs to drive up to Vermont and ask around until she finds someone who will answer “Nope, yah kan’t get thear from heare.” Then ask him if the weather is different or worse than he has ever seen.